Dr. Wendy's Talk At the Carriage Association of America's Winter meeting in Sarasota Jan 2019. After a brief overview of Traditional Chinese Veterinary Medicine, we explore the 5 Element Theory and learn how to determine the Constitutions and use that knowledge to develop more effective, harmonious training strategies for our horses. Equine protozoal myeloencephalitis (EPM) is an important neurologic disease of horses most commonly caused by infection of the central nervous system by the protozoa, Sarcocystis neurona. Clinical signs can be focal or multifocal and are attributed to damage to neural tissues by invasion of the protozoa and concurrent inflammation. Many horses will test seropositive, however, only a small percentage will exhibit clinical signs which implies horses with a compromised immune system are susceptible to infection while horses with a healthy immune system are able to clear the parasitic infection without treatment. Traditional Chinese Veterinary Medicine theory views this disease pattern as a Zheng Qi Deficiency with Qi and Blood Stagnation. Premortem diagnosis in both Eastern and Western Veterinary Medicine involves a thorough neurologic exam and response to treatment. Treatment with acupuncture and herbal therapy alone or in conjunction with pharmaceuticals has a favorable prognosis. Food therapy and rehabilitation can assist the horse to return to full function. Recrudescence and reinfection when the immune system is challenged is a common sequela, therefore, long term care of EPM horses should include TCVM treatment during times when the Zheng Qi may be challenged. Using the Horse's Constitution to Treat "ADR"
Preventative veterinary medicine is an age old concept that is the basis of animal husbandry. As veterinary medicine continues to become more specialized, veterinarians delegate many of the preventative procedures; feeding, housing recommendations, parasite control, farriery, dental care, breeding and conditioning to paraprofessionals and caretakers. The majority of horse owners no longer come from agrarian backgrounds where husbandry practices for the local climate and forage was passed on from generation to generation. Media, funded by corporations that sell vaccines, pharmaceuticals, supplements and processed feeds, have become the largest source of educational material for our clients concerning the wellness of their horses. Many modern horses live in urbanized settings, have little turnout and are fed large amounts of concentrated feeds. Competition can be demanding due to travel, athletic expectations, emotional stress and artificial day lengths. Some horses are more sensitive to stress, temperature, training methods and foods. If we can recognize our patient’s weaknesses, we can be better equipped to help them. The 5 Element theory classifies a basic constitution of a horse and helps us recognize how a horse with a certain constitution reacts with his environment, lifestyle and rider. We can use the constitution to prepare a Traditional Chinese Veterinary Medicine treatment plan to support constitutional vulnerabilities to reduce the incidence of disease, lessen the risk of sports injury and keep the horse happy in its work. Educating our clients on basic care and wellness and considering constitution, diet, environment and seasonal factors will help our sporthorses stay strong in mind, body and spirit throughout their career. Jin is controlled by the Liver so tendon and ligament injury and disease are related to Liver disharmony. The Liver Blood and the Liver Yin keep the tendons and ligaments strong and flexible. Deficiency of Liver Blood and/or Liver Yin leads to weak tendons and ligaments that are prone to injury. Over work, stress, unbalanced shoeing can cause mechanical damage to the tendons resulting in pain aka Qi Stagnation. The Liver is the organ of the Wood Element. We have discussed Wood horses in previous blog posts. The Wood horse is athletic and strong. They want to win and because of that attitude, we sometime push Wood horses beyond their physical capabilities leading to tendon damage. Spring is the season associated with the Wood. Spring is the time we start training after a winter of rest and is the season of muddy deep footing. An unfit horse plus deep, slippery footing are factors that can lead to tendon injury. Diagnosis of tendon damage in Eastern and Western medicine is the same. There will be lameness, swelling, heat and tenderness in the area of tendon injury which is Qi and Blood Stagnation. Underlying conditions are Liver Yin and/or Liver Blood Deficiency as discussed above. Minor tendon injuries can sometimes be spotted on the DAPPE (Diagnostic Acupuncture Point Palpation Examination). We will see sensitive points at the shoulder and upper neck between C2 and C3. If these points are sensitive, along with sensitivity of the tendon locally to palpation, an ultrasound should be done to detect minor tendon damage. If present, treatment, rest and physical therapy should be started immediately. TCVM treatment principles include relieving the Qi and Blood Stagnation and then tonifying the Liver Blood and Yin. Our acupuncture treatment would be focused on local points near the injury along with points to support the Liver Blood and Yin. You may be wondering why your veterinarian is putting in so many needles in your horse’s hind leg when he has a front tendon injury. Many of our points for tendons are on the Gallbladder (Wood element) and Liver meridians which begin in the hind leg. Our main points for tonifying Blood and Yin are also close to the hock and stifle. Herbal therapy includes a topical formula, Relief Salve to increase blood flow to the area to reduce pain and edema along with an oral herbal formula, Tendon and Ligament formula, that treats pain and supports the Yin and Blood. The two main herbs in Relief Salve are Ru Xiang and Mo Yao aka Frankincense and Myrrh. These two tree resins have been used for centuries both topically to reduce pain, swelling and increase circulation to reduce bruising ie “move Blood”. They can also be used orally for diseases of stagnation like arthritis and cycling issues in mares. Ru Xiang Frankincense is aka as Boswellia and is many modern arthritis formulations to reduce pain. Relief salve also contains Zang Nao aka Camphor and Chuan Jiao aka Sichuan pepper. These are both aromatic and contain alkaloids that are quickly absorbed into the skin and cause numbness. Although Sichuan pepper is in the citrus family and is not actually a pepper, it’s alkaloid, hydroxy alpha sanshool, is very similar in structure to capsaicin found in chili peppers so should not be used for horses competing under FEI/USEF drug rules. That being said, if you are treating a tendon injury, your horse should not be competing, they should be resting and given time to heal. Bu Gan Qiang Jin San ( Tonify Liver Strengthen Tendons Powder aka Tendon and Ligament formula) is an oral herbal treatment that relieves pain and supports the Liver Yin and Liver Blood. Its main herb is Gou Qi Zi aka Goji berries which tonifies the Liver Yin and the Jing. Wu Jia Pi aka Siberian Ginseng or Eleutherococcus strengthens tendons and ligaments. It is considered an “adaptogen” which is a buzzword in natural health today meaning it helps the body resist stress. Current research indicates Wu Jia Pi may act on the hypothalamic-pituitary-adrenal axis to moderate the fight or flight instinct which can be very helpful to a Wood horse on stall rest and exercise restriction. Sang Zhi aka Mulberry twig is used as a transporter for the herbal formula to the limbs. Current research indicates compounds in Sang Zhi have Cox-2 inhibition activities similar to NSAIDs like previcox/equiox. Jing is the Qi you are born with. We only have a certain amount so it must be conserved. Horses that have developmental issues or are sick as young horses have a Jing deficiency. Degenerative Suspensory Ligament Desmitis (DSLD) is a Jing deficiency disease. These horses have a genetic defect in the cells that produce collagen to repair tendon damage. Overtime, the tendons and ligaments lose their elasticity leading to pain and slowly increasing pastern angle. We would treat these cases like a tendon injury to relieve the Stagnation and tonify the Liver Yin and Blood deficiency and then we would treat Jing deficiency along with therapeutic trimming & shoeing. The Jing can be supported with Food Therapy. Foods that tonify the Jing are goji berries 25 g (¼ cup) per day and Spirulina 20 g (2 TBs) per day . The Liver Yin and Blood can be supported with some of our horse’s favorite foods, apples and carrots. ​So it’s not all bad news when your horse has a tendon injury. He will get some time off, you can work on your clicker training and recovery involves lots of apples and carrots. Want to hear more about Tendon injury ? 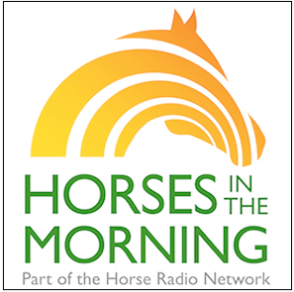 Listen in to our latest episode of Horses in the Morning : Driving. The TCVM segment starts at 29:20. The time has come that our beloved logo needs some fresh inspiration. We wanted to express our dedication to Traditional Chinese Veterinary Medicine, the Five Elements and Dr. Wendy’s mixed Asian-American heritage. We chose a Chinese chop (aka seal) with a unicorn along with the Chinese characters for Animal Doctor. As a nod to Dr.Wendy’s font loving father, we chose 2 cool fonts we knew he would love. Why the Unicorn ? Who doesn’t love Unicorns ? but we chose it for the symbolism of the Chinese unicorn, the Qilin. The Qilin symbolizes the fire element and is a chimera with gem-like scales on a horse shaped body, with a horned dragon like head, a lion’s tail and long hooved legs. They are heavenly creatures and have healing powers. The Qilin is the ancestor of all terrestrial mammals and along with the dragon, tortoise and phoenix resided in the garden of the Yellow Emperor. It is gentle and benevolent. It is said to walk just above the ground so as not to harm a blade of grass or any living creature however they can be powerful in the presence of evil doers to protect the innocent. Like the western unicorn, they can sense someone with a kind spirit and their horn can neutralize toxins. The Qilin symbolizes long life, joy, wisdom, fertility and successful children. Many Chinese families will have a Qilin statue in their house to bring good fortune and it should face towards the door to ward off negative energy. The Qilin are thought to assist souls on the journey between heaven and earth. Like the symbolism of the stork, they bring babies down from heaven and they can act as guardian angels to help guide the spirit to heaven after death. A Qilin was said to be seen just before the birth and death of Confucius. We hope in our practice of TCVM, that we can bring long life, happiness and success to our patients and their families. Equine Anhidrosis - Help, My Horse doesn't sweat ! Sometimes it is difficult to know if your horse is sweating enough. Some early signs may be reluctance to work, panting, sweating only under tack or a sticky dry coat. Some horses sweat more than normal in the months before they stop sweating. Horses with concurrent lung disease like heaves are at a greater risk of heat stroke because they have limited ability to cool themselves by respiration. The sweat glands are highly innervated and are stimulated by the sympathetic nervous system (fight or flight response). The mechanism of anhidrosis in horses has not been determined but In chronic cases, the sweat glands are atrophied, suggesting multiple bouts of heat stroke may lead to more severe symptoms over time. In people, some causes have included congenital, metabolic and autoimmune diseases, skin damage and drug induced causes. In TCVM, the Heart controls the sweat glands and the Lung controls the exterior of the body and the Wei Qi (immune system). The balance between Yin and Yang control the body temperature. The Yin is like the air conditioner while the Yang is like the furnace. Summer Heat is one of the 6 pathogens in TCVM and can damage the Heart and Lung Yin so we view anhidrosis as a Heart and Lung Yin deficiency. Treatment principles in TCVM include acupuncture, herbal and food therapy in addition to environmental modification like monitoring body temperature during exercise, working in cooler weather, taking frequent breaks in the shade, and cooling with water and scraping to help speed evaporation. During pasture and stall time, horses should always have access to shade, fans, salt, electrolytes and cool fresh water. 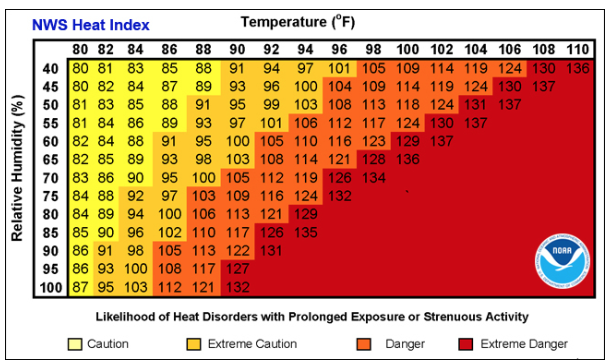 The NOAA heat index chart can help you determine when it is unsafe to work your horse if he is prone to anhidrosis. In south Florida, we are in the extreme caution zone for most of the summer. Due to our high humidity, even in the early morning or late evening. You may have to be vigilant about cooling before, during and after your horse's work out or you may choose to give them some time off during the summer. Herbal therapy in combination with acupuncture has shown great promise in helping non-sweaters. Our recommendation is to start treatment in the late spring and continue through the summer until the heat index consistently falls below 90. This could include acupuncture once per month plus herbal and food therapy daily. New Xiang Ru San is Dr. Xie's Herbal Formula made specifically for horses with anhidrosis. It contains a blend of Bian Dou (hyacinth bean), Xiang Ru (mosla), Hou Po (magnolia bark), Lian Qiao (forsythia) and Jin Yin Hua (honeysuckle flower). Food therapy includes cooling foods to tonify the Heart Yin and pungent foods that tonify the Lung and increase sweating. A variety of foods from this list can be added to the horse's diet as treats or mixed into the feed. You can also check out our recipe for "green tea" ice pops on the feeding seasonally blog post. 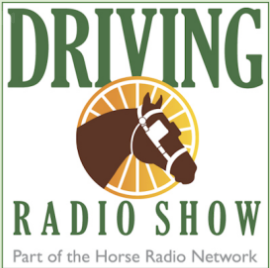 Listen in to the new Driving Radio Show on Horses in the Morning for more TCVM info ! This month our Tremont training tip from Keady Cadwell is how to teach your horse to drive safely in a group, Katie Whaley recaps the Lexington Carriage Classic at the Kentucky Horse Park and Abbie Trexler has some great news about the new ADS vest rule. Plus in the TCVM update, Dr. Wendy talks about non-sweating and managing your horse through the summer heat. Visit the Horse Radio Network for more Equestrain Podcasts ! Heart worm preventative can be started at 8 weeks. Puppies under 6 months, do not need a heart worm test before starting preventative. Puppies over 6 months require a heart worm test before starting preventative. Dogs require an annual heart worm test to renew your prescription. Iverhart plus or Heartgard plus which are oral chews given every month for heart worm preventative and to kill intestinal parasites. Flea Prevention can be started at 8 weeks. Trifexis is an oral tablet that is given every month for heart worm prevention and kills intestinal parasites and fleas. Revolution is a topical liquid applied once per month for heart worm prevention and flea control. Titer testing is available for Parvo/Distemper however rabies vaccination is required by law and titer test results are not accepted. We use a thimerosol free vaccine. If your dog leads an active lifestyle and goes to the dog park, lunch with friends and Sarasota dog meet ups, we recommend intranasal kennel cough boosters annually. If your dog likes to play in the woods, go swimming and kayaking in the rivers and bays, we recommend leptospirosis vaccination annually. If you are boarding your pup, please check with the kennel to determine what vaccines they require at least a month before your stay. These recommendations are in accordance with the current AAHA Canine Vaccination Task Force guidelines. For more information on vaccines, visit the American Animal Hospital Association website. Spring is the time of birth and growth. Foals are born, seeds germinate, sprouts begin to push through the ground and the days become longer. Spring is the time of Yang activity with Qi ascending and expanding. Fresh greens, herbs and fast growing plants are in abundance and are good choices during spring time to move Qi upward and outward to support the Wood element. The Wood’s Zang organ is the Liver which stores the Blood and governs Qi flow. After a long, cold winter with Qi sinking to the interior, the direction of Qi must transition to moving upward and outward. If this transition is not smooth, the Liver can become Stagnant. Sour foods such as citrus, rose hips and apple cider vinegar can clear Liver Qi Stagnation. Sweet and pungent flavors can help develop a “spring within”, with sweet foods such as honey and carrots to tonify Qi and pungent foods, like peppermint and mustard greens to move Qi upwards. Infused waters are a great way to introduce whole foods to the horse and are easy to prepare for the owner. The Mu Ma Spa water can be a refreshing treat for a Wood horse in the spring. Summer with its long days and abundant growth of plants and fruits is also a Yang season. Rising external temperature and high humidity can damage the Yin. Anhidrosis is a common problem with competition horses in the Southeast US. The inability to sweat causes episodes of heat stroke and further damages the Heart and Lung Yin. Cool and bitter foods such as alfalfa and celery can tonify the Yin and keep the body cool. Adding some pungent foods like mint and fennel can help open the exterior and encourage sweating. A wide variety of fresh fruits and vegetables as treats can help replenish minerals lost in sweat. Frozen green tea ice blocks with lemon, mint and cucumber can be added to water buckets to give horses a refreshing drink on hot days. We all know about Yin and Yang in TCVM. Yin is the cold and Yang is the hot and we need to stay in balance to be healthy. In TCVM we also talk about disease in terms of the 6 pathogens(Wind,Cold,Summer Heat,Damp,Dryness and Fire). These pathogens attack the body and disrupt the Yin and Yang balance and block the flow of Qi and Blood. When Qi and Blood are Stagnant, we feel pain and are susceptible to disease. Qi is the body's energy and the Blood (in TCVM terms) are the body's fluids, (white and red blood cells, lymph, stomach and intestinal fluid, intercellular fluids and other body fluids.) We can think of Qi as metabolic energy and the Blood as the immune system and circulatory system. Cold causes blood vessels to contract and slows metabolism. For example, when you have an acute injury, you ice the area to reduce the swelling and relieve pain by dulling the pain receptors in the skin. Cold is obviously associated with Winter. Cold can combine with other pathogenic factors such as Wind, Dryness and Damp to invade the body and attack the body's warming element - Yang. When the Yang is damaged, the body has to work harder to keep warm which can consume the Qi (including the Wei Qi - immune defenses) making the animal vulnerable to disease. In horses, Cold conditions can manifest as cold extremities, arthritic pain and joint stiffness, muscle pain and stiffness, lethargy, respiratory disease and impaction colic. What can we do to help our horses with Cold ? Horses tend to drink less water if it is Cold. Horses with dental issues, especially geriatric horses can experience tooth pain with extremely cold water and will drink less. Warming the water either with a tank heater, bucket warmers or adding a few kettles of hot water to their tank can help them drink more. Adding their favorite electrolyte can help too. If they like cinnamon flavor, adding a stick of cinnamon and a few slices of ginger (both warming foods) can make the water more appealing too. The basic theory of Food therapy is to eat seasonally and to use food as medicine to balance the Yin and Yang. For Cold conditions, this would involve decreasing Cool food in the diet and increasing Warming foods. Before changing anything in your horse's diet, consult with your veterinarian to avoid exacerbating any metabolic conditions. You may want to reduce the amounts of these foods in the diet during the cold months and you might want to add some of these warming foods. As with any dietary change, start slow, use common sense and consult with your veterinarian. Coach Jenn and Dr. Wendy explain how to treat and prevent thrush in your horses the holistic way. These methods may also be used for foot rot in cows, goats, sheep, llama and potbellied piggies. Does your horse have stinky feet ? Of course he does. Its the nature of horses. Sometimes we can't avoid a few months of muddy wet conditions. In Florida, it is a constant battle against moisture vs skin and hooves. When you pick your horse's feet, you remove the dirt from the lateral and central grooves of the frog. A black smelly discharge can indicate thrush. A bacterial infection with Fusobacterium necrophorum is the most common cause but it can be a mixed infection with other bacterial and fungi. Horses can be lame and sensitive to palpation of the sole and heels if the infection travels deep into the foot. Thrush can invade the central sulcus and work its way up between the heel bulbs. In the photo above, this horse has a deep thrush infection in his central sulcus that extends to the hairline. Nerd alert : Latin translation of Fusobacterium necrophorum is the "spindly bacterium of death". In Chinese medicine, we view infection as Heat. This is chronic infection and is black and smelly so we also view it as Damp so we classify thrush as Damp Heat of the hoof. F.necrophorum and other thrush causing organisms tend to be anaerobes, meaning they don't like oxygen. Fungi likes to grow in moist, dark conditions. So knowing all that, our treatment strategy will involve debriding, cleaning and balancing the hoof, reducing exposure to wet muddy conditions, and using a topical treatment to clear the Damp Heat. A regular schedule with your farrier and good hoof hygiene is the first step. An unbalanced hoof and/or sheared heels can contribute to deep sulci and make a horse more prone to thrush infection. In cattle, small ruminants and potbellied pigs, we see a similar condition called foot rot between the toes if they don't have regular foot trims. Your farrier will balance the foot and expose any pockets. This will allow you better access to clean the hoof with a stiff brush and an antiseptic solution such as dilute iodine(weak tea color). If there are deep pockets between the heel bulbs and in the lateral sulci, Hydrogen Peroxide can help by introducing oxygen and the bubbling effect can help mechanically remove bacteria and debris. There are thousands of thrush treatments and they all have varying levels of effectiveness and toxicity. We have an herbal formula that is safe and effective that we make here at 5 Elements for Animals called Thrush Thrasher ! Thank you Dr. Kyle for that great name. Thrush Thrasher liquid contains an herbal formula to clear Damp Heat along with Eucalyptus and Tea Tree oil to help increase the antibacterial and anti-fungal action. and now we also have Hoof Honey Salve for Thrush which has the same active ingredients in Thrush Thrasher liquid but in a thick beeswax base that can be packed in between heels and in deep pockets of thrush. Its water repelling action helps block out moisture to allow the tissues to heal. Bai Zhi - Angelica - In Chinese herbology, we use 3 different species of Angelica roots, Bai Zhi (A. Dahurica), Du Huo (A. Pubenscens and A.Laxiflora) and Dang Gui (A. Sinensis) and each have a different action. Bai Zhi is warm and pungent so its actions can expel Wind, drain Damp, open the orifices(vessels,sweat glands, nasal passages), reduce swelling and drain pus. It is used orally for headaches, flu and infections and topically for ulcers and wounds. The extract of Bai Zhi has shown to have antibacterial effects and increases wound healing by stimulating keratinocytes (the cells that make up the outer layer of skin). Cang Zhu - Atractylodes Refers to 3 species, (A.lancea, chinensis, japonica). In TCVM, we also use another species of Atractylodes, Bai Zhu (A. macrocephela). They have similar actions of draining Damp, but Cang Zhu has a stronger astringent action due to its higher concentration of volatile oils to help dry out the infected tissues, while Bai Zhu has more Qi Tonifying actions. The oils of Cang Zhu root when cut appear red giving it it's common name of red atractylodes. Many of these compounds are also found in Hou Po - Magnolia bark. Chen Pi - Tangerine peel What makes the peel of citrus fruits smell so good ? Essentials oils like Limonene and pinene. These essential oils are used routinely in cleaners because they smell great and act as a solvent remove oils and are less hazardous alternative to turpentine. Tangerine peel also contains flavonoids, which are plant pigments. Flavonoids have many functions in plants, like producing colorful flowers to attract pollinators, fixing nitrogen, acting as chemical messengers between cells like our neurotransmitters and are secreted by plant roots to combat fungal infections. Tangerine peel is warm, pungent and bitter and is a strong mover of Qi and can Dry Damp. Da Huang - Rheum Chinese rhubarb (Rheum palmatum, Rheum tanguticum) has been used as a medicinal plant since 3000 BCE for diarrhea, constipation and infections. It has a strong astringent and antibacterial action due to its high levels of tannins, flavanoids and anthraquinones. Used topically, it can clear Damp-Heat and has antibacterial and antifungal properties. Gan Cao - Glycyrrhiza (G.uralensis, G.inflata Chinese Licorice and G.glabra English Licorice) Is sweet and can Tonify the Qi. It is used in many Chinese herbal formulas to harmonize ie. act as a catalyst for the other herbs and to distribute the herbal energy to all 12 meridians. It is used topically for abscesses and boils. One of the chemical compounds in Gan Cao is mannitol, used in conventional medicine for its osmotic effect. Recent studies on mannitol suggest it decreases antibiotic resistance in many species of bacteria commonly found in skin infections like MRSA and Pseudomonas. Hou Po - Magnolia(Magnolia officinalis) The sweet smell of magnolias in bloom alert you to its high concentration of essential oils. Magnolol and Honokiol are the 2 major phenolic compound isolated from magnolia bark and have been studied extensively for their antibiotic and anti inflammatory effects to treat acne in humans. Eudesmol which has antifungal properties is present in smaller quantities in Hou Po and is also found in red atractylodes. Huang Bai - Phellodendron (Phellodendron amurense) - Bark of the Amur cork tree contains compounds with antibacterial activity and has antioxidant activity comparable to Vit E. It also acts an an insect repellant which is alway useful in wound care for animals ! Herbal "SWAT"
Huang Lian - Coptis (Coptis chinesis,deltoidea,teeta) - Is the root of the Chinese goldthread plant. It is our first choice to treat Damp Heat as it is Bitter and Cold. Berberine is one of the alkaloids shown to have antibacterial activity and the isolated compound is being studied as a possible treatment for MRSA infections. Berberine is also found in Turmeric, goldenseal, California poppy and Amur cork tree. Jiang Huang - Curcuma- Yes turmeric ! I have discussed the antibacterial and antifungal activities of turmeric with Dr. Doug English of Turmeric Life. Listen here. Tian Hua Fen - Trichosanthes (T.kirilowii) is the root of the Chinese cucumber aka snake gourd. It helps to reduce Heat and swelling and helps wound healing.